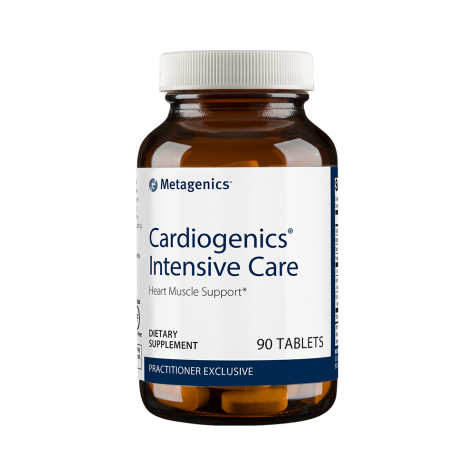 Cardiogenics Intensive Care provides support for the health of the heart muscle. It is designed to help maintain blood pressure levels that are already in the normal range, possibly through assisting blood vessel dilation. This formula delivers powerful antioxidant protection with taurine, selenium, and phytonutrients from arjuna and hawthorn. Along with these herbs is a blend of amino acids and minerals including magnesium, potassium, and calcium, which all play important roles in healthy heart muscle function. Caution: Consult a healthcare practitioner if symptoms persist or worsen, or if you are taking cardiac glycosides, such are digitalis/digoxin, or blood pressure medication. Use for a minimum of 2 months to see beneficial effects. If pregnant or nursing, please speak to your healthcare practitioner prior to use. Clinical Pearls: “When looking for a natural formula to support the heart and its’ ability to perform all the vital functions to keep us alive, Cardiogenics Intensive Care is one of the best out there. We have used it for years with great success!” David Sloan, PhD, NNCP, RNT, Clinic Director – Sloan Natural Health Center.